In a warm and welcoming atmosphere, the Ramada Park Hall Hotel Wolverhampton mixes the old with the new, by merging traditional style with contemporary features. This is one of the reasons we’re a Booking.com award winner and continues to delight our guests with every visit they make. The leafy surroundings and wonderful views offer the perfect setting for those looking to get away from the hustle and bustle of life. A popular wedding venue, our hotel is also the ideal setting for your big day and other family celebrations. 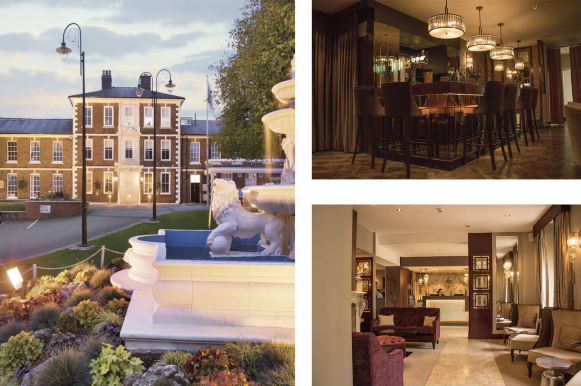 Our location as a Wolverhampton hotel in the heart of the county makes us an ideal base for business travellers or for exploring attractions within the local area. Our hotel in Wolverhampton offers rooms for every type of stay. 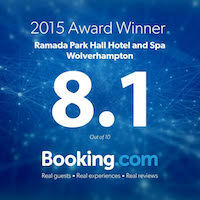 Whether you’re looking for a Wolverhampton hotel that provides luxury suites, family-friendly rooms or standard accommodation that’s a cut above the rest, you’ll relish a stay at the Ramada Park Hall Hotel. We have 74 luxury bedrooms, each featuring an en-suite, with choices of twin or double beds and junior suites. The size of our hotel means we can comfortably accommodate large groups of business travellers and wedding guests, making the Ramada Park Hall Hotel & Spa perfect for any type of stay. For the ultimate dining experience, let the flavours and ambiance of Anju’s take you on a culinary journey through India. 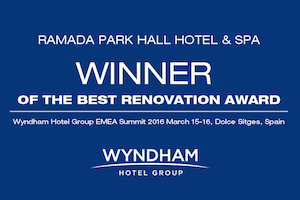 The restaurant has direct access to the hotel bedrooms, whilst offering all the enjoyment and atmosphere of a standalone restaurant. We have a far reaching, eclectic menu that satisfies the tastes and dietary requirements of all diners, which means there’ll always be something you’ll want to try, no matter what type of Indian food you prefer. The delicious fusion Indian cooking and impeccable service makes Anju’s one of the most popular and esteemed restaurants in the Wolverhampton area where guests can enjoy authentic Indian cuisine, infused with a contemporary twist. The stunning décor exudes style and glamour with soft lighting and quality furnishings to set the scene for small business lunches, relaxing lunch and drinks with friends or cocktails late in to the evening on Friday and Saturday evenings. Overlooking the beautiful Park Hall landscaped gardens with breathtaking views of the staffordshire countryside, you can find yourself immersed in the natural light and beauty of The Orangery. Park Hall Health Club and Spa is one of the most exclusive Health Clubs in Wolverhampton. Boasting state of the art fitness equipment, Spa Beauty treatments, fitness classes as well as a fully equipped spa area which includes a swimming pool, sauna, steam room, and indoor jacuzzi. At Park Hall Health Club and Spa Wolverhampton, we have a team of fully qualified and friendly personal trainers who are able to tailor a fitness plan that will help you achieve your fitness and health goals. These may include, weight loss, toning, building muscle, diet and nutrition plans suited to your specific needs. The Spa at the Park Hall Health Club is one of the largest Spas in Wolverhampton and offers guests an indoor heated, black mosaic swimming pool which also benefits from a powerful hydro jet that can be used to swim against or can provide a great hydro back massage. The Spa also offers a state of the art sauna which can assist with breathing problems and can help to enhance the appearance of your skin and steam room for assisting with blood circulation and relaxing after exercise. The indoor Jacuzzi offers the perfect way to unwind after a workout. For the ultimate spa experience in Wolverhampton, Park Hall Health Club has everything you need to relax, unwind and enjoy your day. When the time comes to say “goodbye” to your school friends and teachers, the Ramada Park Hall Hotel offers the best location in Wolverhampton for that all-important prom. We can cater for both year 11 and 13 proms, thanks to a fabulous range of packages that will make a real night to remember. With a huge ballroom, red carpet arrival, DJ and mocktail bar, there’s nothing quite like a Ramada Park prom! Our hotel boasts two amazing restaurants that offer flawless standards, amazing service and incredibly delicious, contemporary cooking you’ll want to experience again and again. The Orangery offers beautiful views over our gardens and can seat up to 150 guests, while Anju’s Indian Restaurant provides the ultimate dining experience with a culinary journey through India.